Let's use up those note cards we have in our stash with this easy peasy swap-a-roo-ski. This swap is super simple and low stress: Take a note card from your stash and use it to write a note to your partner. What you write is up to you. No cheating What does that mean? You can't just write down your favorite quote, sign your name, and call it a day. Write a real note - you can do it! Remember - this is low stress! That means you are not required to decorate the envelope, include a flat surprise, or a tea bag. Hey, if you want to do it, go ahead - however, you are not at all required to do so. Be sure to include your swap-name and name of swap in the note card! No quotes Write a real note. No newbies. If you aren't sure if you're a newbie or not, then you probably are. 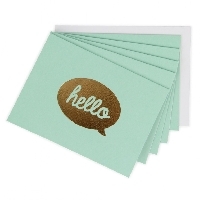 If you receive a note card with a note written inside, rate a 5. While I tend not to have a minimum rating posted on my note card swaps, be forewarned - I do check profiles. I check to see if there are comments to low ratings (and sometimes even email your partner to see if you attempted to make it right), I check dashboards to see if there are swaps with past due dates, and also try to keep abreast of problem swappers and weed them out as well. That includes drama llamas, non-raters, and just plain old sucky people. Bonus - everyone who participates in this swap is entered into a drawing for a RAK!!! Now grab a note card and let's get to swappin'!